Rottweiler Training Potty Training Time! Potty training can be the number one most frustrating part of owning a dog. 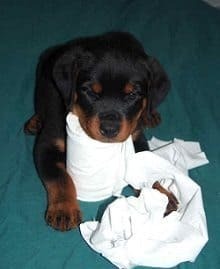 Whether your Rottweiler is a puppy, or a grown dog, you must be patient and consistent in your potty training (housebreaking) to ensure that they know when and where they are supposed to go to the bathroom. It is important to remember that potty training is not easy, it does not happen overnight, and it is up to you to teach them. Sometimes we forget that our Rottweiler can not just go into the bathroom, shut the door, and go potty whenever they please. They rely on us as their masters to let them out to go potty. You must first be consistent when potty training your Rottie. That means, especially if the Rottie is a puppy, you must take them outside often. And by often, I mean every hour or two minimum! When you take them outside, you want to take them to an area of your yard that you would like to designate as the potty area. With their leash on, place them in the designated potty area and say in a positive and friendly voice, “Go potty, Rottie!” Of course, you must use your Rottweiler’s name, I will just pretend their name is “Rottie” to make it easier to understand. Continue to encourage them. Especially if your dog is still a puppy, they will probably go shortly after you put them in the potty area. When they finally squat and go potty, you must immediately give them a huge praise. Make a fuss, give them scratches behind the ears, and big pats on the head. And immediately take them back inside. Do not leave them out in the yard to run and play. This is fine to do once potty training is established, but in the training stages it is important to be clear and consistent. Now, in about an hour or two, you must do this again. Follow the same instructions. Exactly. When they have done their business, as big or small as it may be, immediately praise them and bring them back inside. After doing this a few times, it is ok to give your Rottweiler a treat. 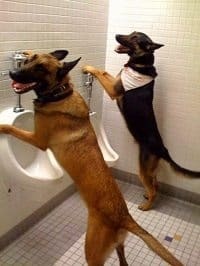 But do not do this every time you take them out to go potty, or they will associate only going potty outside if they know that a treat is involved. If your Rottweiler does not go potty while they are outside, don’t stress. They may not have to go. If you have been outside for a while and they don’t go, simply take them back inside, but do not praise them, just go back in and continue on with your business as usual. No one wants to get out of bed to take the dog outside. Especially if it is raining or snowing. But this is a huge responsibility as a pet owner. If you’re Rottweiler is a puppy, this is even more important. Before you go to bed, take your puppy out to go potty. If they go, give them praise. When you go back to bed, set your alarm for another hour or two. When the alarm goes off, take your puppy out again. Even if they are sleeping, wake them up and take them out. If they go, give them praise. If they do not go, just take them back inside and go back to bed. Now, this is where it get’s frustrating. You will need to set your alarm again for another hour or two. If your puppy went potty when you took them out last, you may be able to get away with setting it for two hours, but if they did not go, it would be a good idea to set it for an hour and try again. This is the crappiest part of potty training, no pun intended. All puppies and dogs are going to have occasional accidents. Why is that? Because it is an accident. It’s not an intentional thing. Maybe your Rottweiler got excited while you were in the other room or at work and went potty on the floor. Maybe they just couldn’t hold it. That is why it is important to be consistent in letting your Rottweiler outside often. When this inevitably happens, you must keep your temper. Do not ever hit the dog for messing on the floor. This only lowers your dog’s self­esteem. Low self­esteem can be a cause of them going potty on the floor, so we want to make sure we build our Rottweiler’s confidence. If you come home and your dog has made a mess, you must clean it up and say, “No, Rottie. Potty outside!” And take them outside to their designated potty area. If they do not go, do not praise them. If they go, then and only then may you praise them. Potty training is a very difficult and frustrating job that you must start teaching them immediately. If you are consistent about taking them out, and teach them that going potty outside gets you praises, your job can become much easier in the future. Potty training does not happen overnight, same goes for any type of dog training. 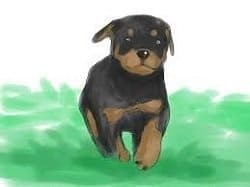 It may take months to fully train them to go potty outside, but if you take them out often, give them good praises when they go potty outside, take them out several times overnight, and discipline them properly without breaking their confidence, your Rottweiler will be more than happy to continue going potty when and where they are supposed to. Andrew developed a love for Rottweilers on his family farm where he grew up with his two amazing Rottweilers, Jax and Shadow. He developed an incredible bond with them from a very young age and his life was forever impacted by these amazing dogs. He has worked with quite a few Rottweilers now and his love and passion for this breed continues to grow everyday.